Get up close and personal with more than 100 exotic cats, including 15 different species of wild cats, on this guided walking tour of Big Cat Rescue, an educational sanctuary in Tampa. Listen and learn about the plight of the big cats in the wild and in captivity while walking through 45 acres of leopards, lions, tigers and other feline friends. Get within a few feet of these beautiful creatures and hear the story that brought them to the sanctuary. Choose from the 90-minute tour or a 1-hour kid’s tour. 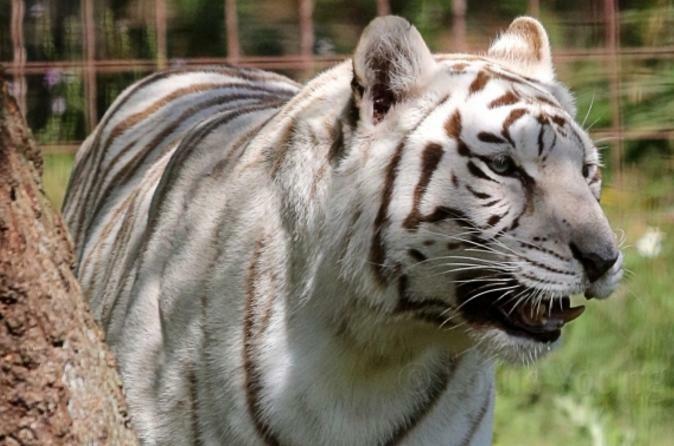 The Tampa Big Cat Rescue is only a 15-minute drive from downtown Tampa. Big Cat Rescue has the distinction of being the world’s largest accredited sanctuary that’s dedicated entirely to abused and abandoned exotic cats. Some of the sanctuary’s celebrity supporters include Bo Derek, Harrison Ford and Leonardo DiCaprio, to name a few. On this 90-minute wild cat rescue tour, see over 100 lions, tigers, leopards and other feline friends that have been saved from abuse and abandonment. The guide at Big Cat Rescue will share the animals’ tales of hardship and triumph, like the serval that was rescued from a cold, dark basement. The stories are plentiful. One cat was confiscated from a drug raid, another got too old for the circus, and yet another was simply neglected by its owner. These cats can’t be returned to the wild, but the sanctuary does give them the most natural existence they could possibly have. On the 1-hour kid’s tour (for ages 10 and under), get a behind-the-scenes look at Big Cat Rescue’s operation and learn more about the exotic cats and other animals that live here. Keep in mind this is a sanctuary, not a zoo. People are not allowed to wander around by themselves. This tour is guided and provides an educational experience on the plight of big cats in the wild and in captivity and what can be done to save them. Big Cat Rescue has a dozen species of cats, many of whom are threatened, endangered or extinct in the wild, including tigers, lions, leopards, cougars, bobcats, lynx, servals, ocelots, caracals, and some exotic hybrids. Some of the sanctuary’s celebrity supporters include Bo Derek, Harrison Ford and Leonardo DiCaprio, to name a few.